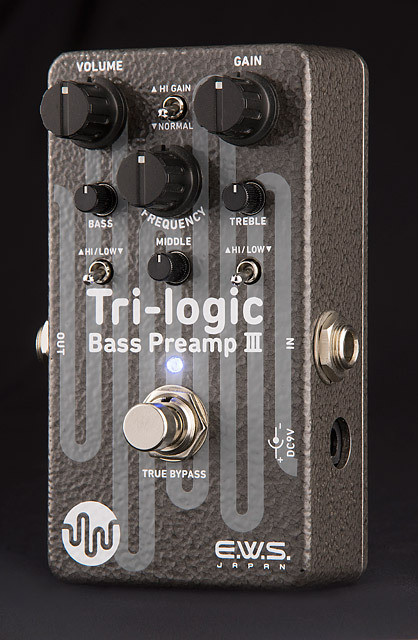 Third generation Tri-Logic3 keeps the same neutral characteristic as the Tri-Logic1 and 2, minimizing the coloring of tone, but also has an abundant of added features and flexibility to correspond with any bass guitar. 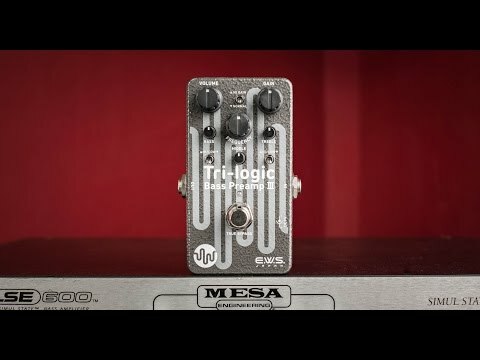 Gain control has an option between clean boost mode (Normal), with a maximum of +18db, or high gain mode (Hi Gain) with compression at +26db. 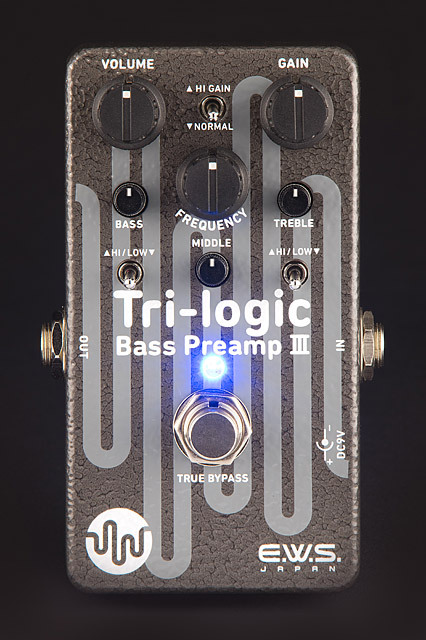 The Treble control provides ±15db and can be switched between 4KHz (low) or 8KHz (high) with toggle switch. The Mid control knob provides ±10db and allows for sweeping between 250Hz to 3KHz. 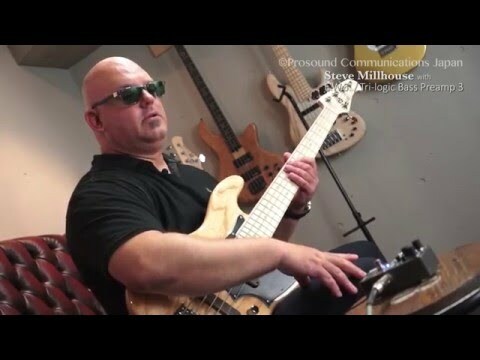 The Bass control provides ±15db, switchable between 40Hz (low) and 80Hz (high), and allows you to obtain accurate and flexible sound in any playing environment. Operating voltage option is 9VDC or 18VDC. Compared to 9VDC, 18VDC has less distortion with wider range of tone, but please be aware at 18VDC battery will drain faster. Either 9VDC battery or 9VDC power adapter can be used. *Please only use the regulated negative tip 9VDC power adapter. *Please do not use other adapter except for a 9VDC negative tip power source to limit possibility of failure. Relatively loud popping noise may occur when you use the foot switch for ON/OFF or change the mode using each mode switch shortly after turning the power on, or shortly after switching between 9VDC and 18VDC. This is not a device failure. Repeating the ON/OFF with foot switch to stabilize the operating voltage can reduce the popping noise. 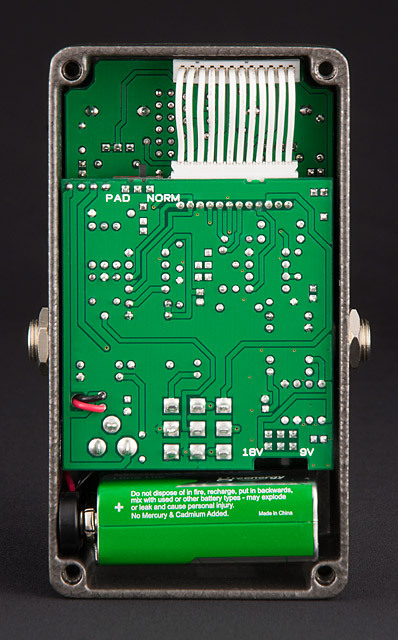 Please make sure that the effect is turned off when using the Dip Switch located inside the pedal to switch between 9VDC and 18VDC to protect the pedal’s internal electrical parts, bass guitar and other effect pedals you are connected to from excessive load. 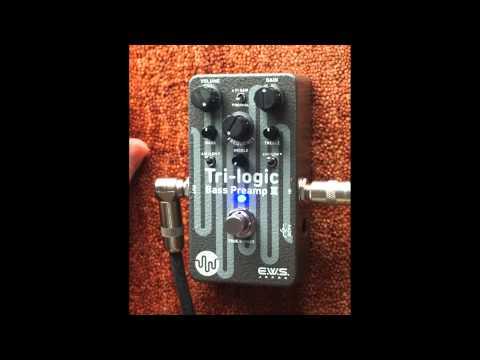 Steve Millhouse - Tri-logic Bass Preamp 3 by E.W.S.